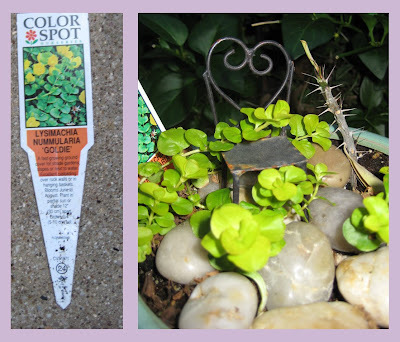 My fairy gardens are doing well and I especially like this little plant growing around the tiny chair. Don't ask me to pronounce it! Lysimachia Nummularia "Goldie". Got it at Home Depot. Wish I'd taken better notes of plant names at the fairy garden workshop at Blue Moon Gardens. The miniature plants are healthy and happy, but I've forgotten their names. Ah, yes. That would be a Senior Moments Fairy Garden ... Or maybe a pooka garden at Chumley's Rest. I'm missing my sons this evening. This is a prop portrait of my eldest as Elwood P. Dowd next to his tall rabbit buddy. I did the drawing for a production of "Harvey" about fifteen years ago. I'm grateful for the joy and wisdom our family shared through rehearsals of this wonderful play. Harvey would love playing tricks on this April Fool's Day. Who buys all those plastic eggs? I'm not a doorbell, but I play one on t.v.